Flat Out Love is the story of freshman college student Julie Seagle. Upon her arrival to Boston from Ohio, Julie’s craigslist apartment turns out to be a scam. Her mother immediately calls on her college friend, Erin Watkins for help. Julie moves in with the Watkins family, a family she has never met before and who has a very “Big Bang Theory” feel to their home. Each member of the Watkins family has their own quirky qualities, which undoubtedly I love. Celeste, the youngest daughter of the Watkins, age 13, is especially unique as she insists on carrying around a cardboard cutout of her oldest brother, while he is traveling the world. She does this because she misses him so much and she wants him to continue being a part of the family while he is gone. While Finn comes across as the hysterically funny world traveler without any seemingly responsibilities, Matt, her other brother, is a MIT student who basically eats, sleeps, studies and takes care of Celeste, acting like more of a parent than their actual parents. Flat Finn is as much of a "real" person as everyone else in Boston and you will find yourself as attached to him as Celeste. I especially loved the interactions with Julie and Celeste and I appreciated how easily Julie accepts and loves this family just as they appear, strange tendencies and all. This is a moving love story that encompassed me. There are parts of this story that had me laughing out loud and there were parts of the story where I wanted to scream out in frustration towards Julie to put the pieces together before her cozy status as a surrogate Watkins family member came tumbling down. Normally book boyfriends are written as physically fit, drop dead gorgeous and confident so you are pleasantly surprised to find yourself falling and rooting for shy geeky Matt to profess his feelings and win Julie's heart. I can honestly say I was truly sad when the story ended because I grew to love Julie and the entire Watkins family and I just wanted to read more about them. 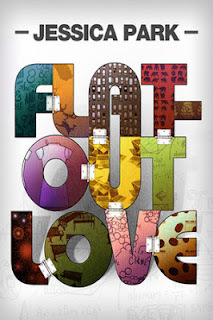 (Obviously, I am super excited for Flat Out Matt, a companion novella to Flat Out Love!) Matt, Julie and Celeste worked hard to overcome their pasts and choose to live for their futures. Jessica Park is an exceptional author and I highly recommend this book.